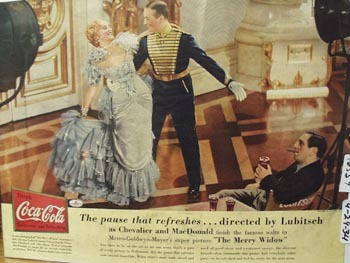 Coca-Cola Jeanette MacDonald Ad 1934 This is a September 29, 1934 advertisement It is a great color ad from The Coca-Cola Co. Has a great picture of Jeanette MacDonald and Maurice Chevalier in the movie The Merry Widow. Movie directed by Lubitsch who is sitting in his chair and enjoying a Coca-Cola. With nice graphics from an early magazine. In mint condition. Photo is taken through plastic and may show wrinkles or crookedness that is not in the ad. This magazine tear sheet measures 13 3/4"" wide by 10 1/2"" tall. Items Similar To "Coca-Cola Jeanette MacDonald Ad 1934"